Remember that maddening "Personalised" Start Menu option Microsoft introduced with Windows and Office that hides certain applications and items you didn't use as often behind a chevron? Alas it looks like Gmail has been given a similar "feature" as of this afternoon. 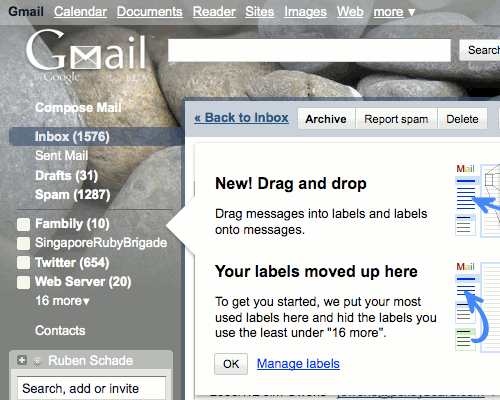 When you browse to Gmail now, only a subset of your labels are shown, along with an option to change what's visible. Fortunately this allowed me to painstakingly click "show" next to each one to display them all again. Neal from the IntoYourHead show seems to like this though, which leads me to think at the very least Google should have given us the option to disable/enable this function. Unless they don't think we can handle such a thing. Grilled cheese sandwich irons have handles, and aside from the occasional blindingly painful liquid cheese scaldings I'm fine. UPDATE: I’ve been told you can click the “Show All” link in the Settings→Labels screen to show all your labels again. Whew! Normally I'm not this harsh (at least I hope I'm not!) but I was so vocally against this when Microsoft did it, and now Google is doing it with Gmail. I really hope this isn't becoming a trend. This also raises another issue with this whole Cloud Computing (or whatever the latest 1337 catchphrase is) concept: we don't really have any control over these web apps.